This is a go-to, make-ahead recipe when you want an impressive knockout appetizer. Hummus, feta cheese and Kalamata olives come together to create an exotic taste for your next gathering. Not only does this Greek Dip taste great, it’s low in calories as well. Move over Mexican — this Mediterranean-inspired dip will be your new party favorite! Serve with pita chips. 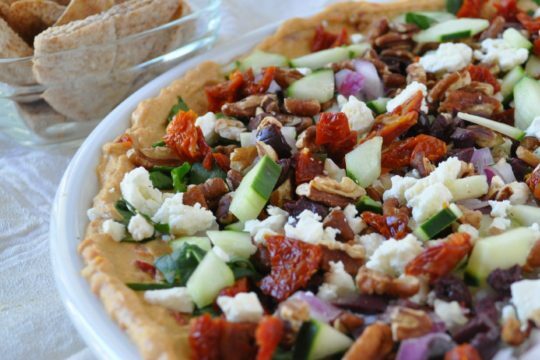 Spread hummus on 9-inch serving plate and top with 1/4 cup chopped red onion, 1/4 cup crumbled reduced-fat feta cheese or crumbled goat cheese, 2 tablespoons sliced Kalamata olives and 1/4 cup chopped pecans, toasted. Sprinkle evenly with remaining ingredients, refrigerate until serving time.